Whereas Schönberg and others devoted themselves to the twelve-tone principle as their compositional basis, Wyschnegradsky tackled the very essence of tone intervals: in his theoretical writings he worked out not just whole-steps and half-steps but went as far as third, quarter, sixth or twelfth tones, to later use them in his compositions. And two pianos detuned a quarter-tone apart can, after all, even be made to produce a "meandering" glissando effect. 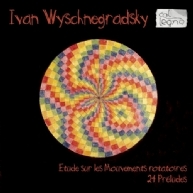 Both compositions on this album, the Etude sur les Mouvements rotatoires (1961) and the 24 Préludes dans l’échelle chromatique diatonisée à 13 sons (1934; 1969/79), are based on the quarter-tone principle. It is interesting to note that if one listens beyond the quarter-tones, the underlying basic structures of the pieces are quite clearly reminiscent of Scriabin or even Rachmaninov. And one thing is certain: once you've started listening to quarter-tone compositions you'll become addicted immediately: you won't be able to stop, and you sure won't want to stop listening, especially to these amazingly free and electrifying interpretations by the piano duo Sylvaine Billier/Martin Joste. Even before he became Arnold Schönberg’s student, Alban Berg wrote some 40 Jugendlieder, ’early lieder’: Romantic poetry as mirrored by the Fin de Siècle.